Manifest. Allows you to bring your dreams and ideas into physical form. Serenity. Assists you in going within to your private garden of peace. Anxiety Relief. A calming, clinically proven blend created to relieve anxious stress. Combining flower essences and the essential oils of Orange, Rose Geranium, Ylang Ylang. Hope. A rich combination of flower essences, and Frankincense, Laurel, and Neroli essential oils to restore the heart and spirit in times of grief, depression, and sadness. Renewal. Enliven and revitalize your senses with tantalizing aroma of Bergamot, Grapefruit, Lime, Orange, and Yarrow combined with flower essences that will invigorate you. Great Expectations. Allowing the space for our ideas to grow in thought and physical form. Release. Relax, unwind and le go. Indulge in the truly uplifting experience of Lemon Grass essential oil blended with flower essences to help let go of old habits. Inner Beauty. An exquisite fusion of flower essences and Bergamot, Clary Sage, Chamomile, and Sandalwood oils that will bring forth your inner radiance. Sweet Dreams. Sweet Dreams. This tranquil aroma relaxes the body and calms the busy mind while promoting sleep. Sweet Dreams is a synergy of Bergamot and Ylang Ylang essential oils and flower essences. The Fleur Collection contains six flower essence and essential oil blends, formulated to restore harmony and balance. Anxiety Relief, Hope, Inner Beauty, Release, Renewal and Sweet Dreams are available in spray and applique' as well as therapy blend essential oils. Mist lightly in a room or around the body; close your eyes and breathe deeply. This little roll-on applicator fits in your purse and is perfect for applying Fleur essential oils and flower essence to temples, neck, or wrist. 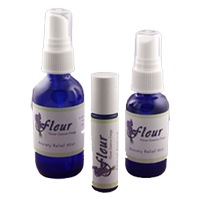 Amplify any of your protocols by adding our flower essence and essential oil blends. "Flowers are a gift from nature, healing tools in beautiful packages. The sensory allure of flowers encourages us to bring them into our environment, where they provide aesthetic delight as well as curative energy." Maggie Smith is the creator and driving force behind Flower Essence Energy. An advanced energy healer and medical intuitive, she has over 15 years of training in mind-body wellness through the School of Energy Mastery, the Chopra Center or Well Being, Australian Living Essences and the Flower Essence Society. She is a Certified AMTA Aromatherapist, her workshops and classes on the therapeutic use of Flower Essences and Aromatherapy attract healers working in a wide array of modalities. Maggie is considered by many to be one of the leading experts in her field. "one client of 5 years told me she had never had a more relaxing massage." "My clients are raving about how much tension and pain is released when I use the Release Mist." "Flower Essence Energy mists help to bring the body back into harmony on an aromatic as well as a vibrational level. Our guests and our therapists benefit greatly." Flowers are one of God's most beautiful and vital creations. Each flower has a vibrational signature. When we come into contact with flowers our own unique vibrational energy resonates with their beauty, fragrance, and energy. Flower Essence Energy products literally capture the energy of flowers in a bottle. Like homeopathic remedies, they are vibrational in nature, working through the human energy fields, gently resonating to re-balance emotional issues. Products are 100% natural. Each bottle is enhanced with flower essences and blends of pure organic essential oil, providing an added level of sensory therapeutic healing. Flower Essence Energy products are not mass produced. Each bottle is created individually with the purest ingredients and infused with loving intention. Dr. Wayne Dyer finds our flower essence sprays support his creative process. "Every morning just before I begin to write I spray 'Inspiration' *(18) times. It is wonderful; that mist just coming down over me. It opens things up." "Flower Essence sprays are an amazing and fast way to change the energy a client "presents" with when they come to our spa. It can really accelerate the results of a treatment. Having the spray to use at home encourages the guest to take ownership of the emotional aspect of their condition. They are an incredible tool that produces a synergy with the hands on work of our therapists." "This has been my first opportunity to thank you for your amazing healing essences. I ripped open the box and took the tincture and dowsed myself with the spray. The sense of peace and calm that overtook me was palpable. You are amazing."